The St. Louis Rams had a 5-3 record and the NFL’s top-ranked offense as they hosted the Baltimore Ravens on November 9, 2003. The Rams, coached by Mike Martz, were averaging 374.5 yards-per-game as they continued to be the potent and high-scoring team that they had typically been since the 1999 Championship season. However, Marc Bulger was now the quarterback in place of Kurt Warner and was not as accurate of a deep passer. To be sure, he still had outstanding wide receivers in Torry Holt and Isaac Bruce and RB Marshall Faulk was back after having missed five games with hand and knee injuries. Moreover, the Rams had won ten straight home games. The Ravens, under the guidance of Head Coach Brian Billick, were also 5-3, but were very different in style from their opponent. Baltimore was known for defense, with MLB Ray Lewis the most notable star, and a conservative, ball-control offense that featured RB Jamal Lewis, who was leading the NFL in rushing. 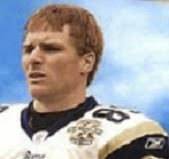 Rookie Kyle Boller was the quarterback and their best receiver was TE Todd Heap. There were 66,085 fans in attendance for the Sunday night game at the Edgar Jones Dome. The Ravens had the first possession and moved well as Jamal Lewis had runs of 20 and 23 yards to start the series. But after reaching the St. Louis 30, Kyle Boller’s pass was intercepted by CB Jerametrius Butler, who returned it 45 yards to the Baltimore 36. Three plays later Marc Bulger threw to Torry Holt for a 24-yard gain that had five yards added (half the distance to the goal) due to a face mask penalty, putting the Rams on the five. 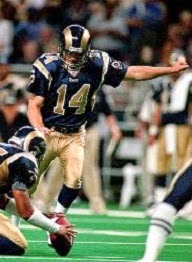 From there, Marshall Faulk ran for a touchdown and Jeff Wilkins (pictured above) added the extra point. The Ravens punted following their next possession and WR Dane Looker, picking up the rolling ball, returned it 44 yards to the Baltimore one. Faulk again scored, Wilkins converted, and with most of their yardage coming on interception and punt returns, the Rams were ahead by 14-0. Baltimore again had to punt following its next series but got a break when CB DeJuan Groce muffed the catch and safety Gerome Sapp recovered at the St. Louis 15. A holding penalty moved the Ravens back ten yards and they ended up having to settle for a 43-yard Matt Stover field goal. The teams exchanged turnovers as Bulger was intercepted by Ray Lewis on the next series and Jamal Lewis fumbled the ball back at the St. Louis 11 four plays later. In a possession that extended into the second quarter, the Rams were able to get only to their 26 and punted. Now the Ravens benefited from a good return when DB Lamont Brightful gained 24 yards, and an unnecessary roughness penalty put the ball on the St. Louis 33. Boller completed two passes for 14 yards and Jamal Lewis ran three times to get to the five yard line, but a sack and an incomplete pass caused the visitors to again settle for a field goal as Stover connected from 25 yards to make the score 14-6. The Rams had to punt from deep in their own territory following the next series and Baltimore took advantage of good starting field position to drive 45 yards in five plays. The big play was a Boller pass to WR Travis Taylor that picked up 40 yards and Jamal Lewis (pictured at left) finished the possession off with a two-yard touchdown run. Boller’s pass for a two-point conversion was incomplete, but the Ravens were now behind by just two points at 14-12. The Rams again had to punt after a short series, but Boller fumbled when being sacked by SS Adam Archuleta, who then recovered and ran 45 yards for a TD. Wilkins added the PAT and St. Louis was up by 21-12 with a minimum of offensive output. Regaining possession with 4:38 to go in the first half, the Ravens advanced 80 yards in 10 plays. Boller had completions to Todd Heap for ten and nine yards, the second coming in a third-and-eight situation and a pass interference penalty picked up 28 yards to the St. Louis 31. Following a short carry by Jamal Lewis, Boller threw to Taylor for 25 yards and, two plays after that, to OT Jonathan Ogden, who was lined up as an eligible receiver, for a one-yard touchdown. Stover added the point after and the score was 21-19 in favor of St. Louis at halftime. The Ravens had driven into St. Louis territory seven times and outgained the Rams by 206 yards to 38, but were two points behind and had now lost Boller to a knee injury. A short series by the Rams to start the third quarter ended with a punt and the Ravens, now with Chris Redman at quarterback, also punted but retained possession when Groce fumbled the return and safety Chad Williams recovered at the St. Louis 28. The visitors picked up five yards from there and Stover kicked a 41-yard field goal that put them in the lead at 22-21. The teams exchanged punts, and then interceptions. Early in the fourth quarter, Wilkins kicked a 49-yard field goal that put the Rams back in front by 24-22. Another series by the Ravens ended with an interception as LB Tommy Polley picked off a Redman pass and returned it 22 yards to the Baltimore 36. Four plays later, Wilkins kicked a 46-yard field goal to make it a five-point game. Once again St. Louis benefited from a turnover when Jamal Lewis fumbled and DT Brian Young recovered at the Baltimore 35. Keeping the ball on the ground, the Rams got another field goal from Wilkins, this time from 48 yards. On a series in which Redman was sacked on back-to-back plays, the Ravens were forced to punt from deep in their own territory and WR Mike Furrey returned it 17 yards to the Baltimore 35. Bulger completed passes to WR Isaac Bruce for eight yards and Holt for 10 and Wilkins kicked his fourth field goal of the game from 27 yards with 1:45 left to play. That provided the final margin as the Rams won by a score of 33-22. The Rams had a mere 121 yards of offense, to 267 for Baltimore, and the Ravens dominated in first downs (16 to 7) and time of possession (37:21 to 22:39). However, the Ravens also turned the ball over seven times, to four suffered by St. Louis, and were penalized 10 times at a cost of 80 yards, to seven flags for 75 yards thrown on the Rams. St. Louis also recorded seven sacks while Baltimore had four. Marc Bulger completed only 13 of 26 passes for 110 yards with no touchdowns and two interceptions. Marshall Faulk scored on two short touchdown carries but gained just 48 yards on 20 carries and had six more yards on three pass receptions. Dane Looker (pictured at right) and Torry Holt had identical output with three catches for 38 yards apiece, and while the total put Holt over a thousand yards for the season, it was easily his lowest total of the season. Looker also had the 44-yard punt return and, on defense, Jerametrius Butler intercepted two passes. Jeff Wilkins kicked four field goals in as many attempts, which proved to be vital. For the Ravens, Jamal Lewis rushed for 111 yards on 27 carries that included a TD, but also lost two fumbles. Kyle Boller was successful on 10 of 21 throws for 112 yards and a TD as well as giving up an interception before suffering the injury that proved to be effectively season-ending (he was active for the last two games but threw just one pass), and Chris Redman went 7-of-12 for 58 yards and had two intercepted in relief. Todd Heap caught 6 passes for 49 yards and Travis Taylor gained 65 yards on his two receptions. The Rams stuck with Bulger and the win over the Ravens proved to be the first of seven straight, on the way to a 12-4 record and first place in the AFC West. However, they lost the season finale, which forfeited the opportunity to have the top playoff seed in the conference, and then fell to the Panthers in the Divisional playoff round. Baltimore lost again the next week but recovered to win five of their remaining six games to top the AFC North at 10-6. The Ravens lost to Tennessee in their Wild Card playoff game. Marc Bulger went on to gain selection to the Pro Bowl as he passed for 3845 yards and 22 touchdowns, although he also gave up 22 interceptions. Marshall Faulk recovered to rush for over a hundred yards in each of the next four games, ending up with 818 yards on 209 carries (3.9 avg.) and 45 catches for 290 yards (6.4 avg.) while scoring a total of 11 TDs. While lesser numbers by comparison to the high standards he had set in previous years, it was still a respectable performance as his career entered its downside. Jamal Lewis had a career year, leading the NFL with 2066 yards on 387 carries (5.3 avg.) and scoring 14 touchdowns. He was a consensus first-team All-NFL selection who was also named to the Pro Bowl and received NFL Offensive Player of the Year recognition from the Associated Press and was named MVP by the Pro Football Writers.